Our goal and great desire at Vapor Rino is to provide you with the best possible cutting edge cleaning products and services available today. Having worked in the private contracting business world, specifically in the in the area of bathroom restoration we know what its like to run a small business. We also know how important a contractors tools are. Having offering tile and grout vapor steam cleaning as part of our professional services we are uniquely positioned to have insight into the needs of today's cleaning professionals. 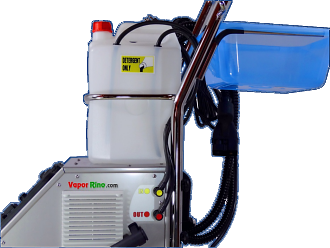 We have actually used vapor steam cleaners not only at home for private use but also for generating income. Until a person has actually attempted to utilize this type of technology it is often hard to fully understand all of the rewards and challenges of working with steam. Our very first challenge in working with steam was to adapt relatively low power and just adequate steam production of virtually every vapor steam cleaner we tested. One of the first things a contractor notices about the typical 120 volt vapor steam cleaner on the market today is the relatively low starting PSI and rapid drop in pressure once you begin cleaning. Though they work well and generate plenty of steam to produce great results our wish has always been for MORE POWER. For right around 20 years the industry has been looking for a solution. Well, now we have it, now we are ready to provide it to the world. Enter, Vapor Rino! Our desire is to give every home, place of employment, business and government agency easy access to some of the most powerful green cleaning technology North America has ever seen. We want to help not just individuals but whole homes, communities, and states fulfill their green, environmentally friendly goals. We are working continuously to provide low cost, easy access to Vapor Rino's superior steam cleaning technology. The technology of tomorrow, is here today! integrity by putting people first. to you rapidly and directly. industrial / commercial steam cleaners. • Provide high quality products and the best possible prices. • Strive to meet our customers needs honorably & respectfully to the best of our abilities. America's cleaning professionals through green cleaning practices. honor, truth and integrity by putting people first. products available today at industry leading prices. those refinements to you rapidly and directly. to assist our customers in their desire to to strive for success. neighbor as we love ourselves. Service is important and that includes customer service as well as community service. We believe we should all, when we can, help in our communities. When hurricane Irene hit in 2011 it devastated many areas of the up state NY region. We were proud to be a small part of the recovery effort. One town where we helped in the recovery effort was Prattsville NY. As we first drove into this small river side town we experienced a sense of shock and great sadness. What we saw was a town that was for the most part, wiped away. Homes were either missing or removed from their foundations. Many were made homeless. We helped people pull what little remains they had out of the mud and silt and transport them to storage. We also helped at a nearby Christian retreat center that was set up as a emergency shelter. As VaporRino.com expands our desire is to be able to help more and do more, all this with your help. 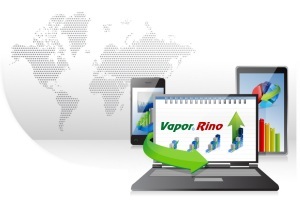 We sincerely thank you for your support and for shopping Vapor Rino commercial steam cleaners. Our business model is as follows. We feel every American is essentially a brother or sister of sorts. With this sense of unity we strive to treat our customers with the respect they deserve. Our hope is to fulfill your orders with big business efficiency while at the same time catering to each individuals needs with respect and a home town, family feel. It has been said, "do on to others as you would have done on to you". In other words, love your neighbor as you love yourself. These words speak directly to our hearts. We hope they do yours as well.